INLS161-002 Fall 2017 Information Tools | what is a markup language? Information Tools | What is a Markup Language? What is a document markup language and how do its components work? What is a "markup language"? A markup language identifies pieces of a document so that another application can do something with those pieces. All document creation tools have a markup language. In early days of text processing, some markup tools used to let you see and edit their markup code; Word and MacWrite usually didn't. 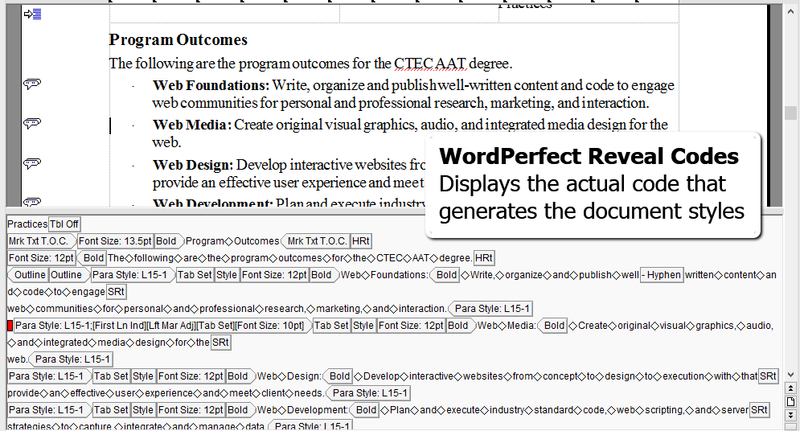 The following image shows an example of how WordPerfect showed you the markup in the text. these instructions are called markup. generic markup describes the thing to be printed (heading, cross-reference, etc.). Markup has a long history. But one can understand markup by thinking about some markup languages that you are already familiar with. HTML, the HyperText Markup Language, is an example of SGML - Standard Generalized Markup Language. WordStar was one of the earlier ones. Since there was no graphical user interface at that time, it had to show you in text what it was doing with its markup, much as the UNIX text editors do. WordPerfect was very good for text-centric documents and was thus embraced by folks creating legal documents. The ability to see and control the text markup was critical. There have been a lot of markup tools brought to market over the years. 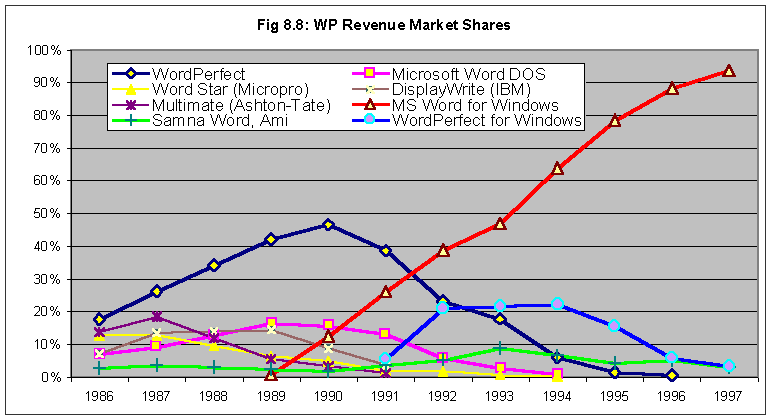 But Microsoft's Word soon became the dominant markup tool. There are a lot of possibilities out there. LibreOffice Writer may eventually become a competitor to MSWord because it is based on XML and on the Open Document standard and has most of the same features as MSWord. It may well be the best choice for many. But, for now, although not everyone likes it, MSWord is a very powerful tool. But are MSWord and LibreOffice Writer simply word processors? And what is the difference between a text editor and a word processor? Are they something more? Perhaps an object manipulator? MSWord is not the only tool out there, but it is a business standard. To do so, open The Awful German Language, by Mark Twain. Copy it all, then paste it into a document so we can work with it.